Almost every blogger these days has an eBook available for free download. It would be nice to know how many times that eBook has been downloaded, wouldn't it? Fortunately, Google Analytics provides us with a way.You can create an 'Event'. Note: Google is slowly migrating from it's classing analytics code (ga.js) to Universal Analytics (analytics.js) To determine which you are using, do a 'Vire Source' on any page in your blog and look for 'ga.js' or analytics.js'. onclick="_gaq.push(['_trackEvent', 'Downloads', EBooks', 'Book 1']);"
Track downloads separately from any other events you might create. Seperately track the number of downloads of each ebook. onClick="ga('send', 'event', 'Downloads', 'Ebooks', 'Book 1');"
Separately track the number of downloads of each ebook. Log in to your Google Analytics account. Go to Behavior->Events->Top Events to see how many times your ebook has been downloaded. One of the frequent complaints I hear is that a YouTube video imbedded in a blog post does not appear in the blog's RSS feed. This is also true for the 'Subscribe via Email' facilities found on most blogs. The sad truth is that RSS is not a multimedia protocol. For our own clients, we have a routine we have written that detects when the WordPress function the_content() is being used for an RSS feed. It scans the post and replaces the embedded YouTube video with an image. The image is linked back to the blog post. The result is that RSS feed consumers wil see the image, click on it, and view the video in the original blog. Which Website Pages Are Your Mobile Visitors Viewing? When creating a mobile-optimized website, It is important to create the shortest path possible (the leat number of taps) to the content mobile visitors want. Google Analytics allows us to do that, though it is a little laborious. Drill down in the left sidebar menu through Behavior and Site Content. Click on All Pages. Locate the Secondary DImension drop-down above the header. Drill down through Vistors and click on Device Category. The display will refresh with a new Device Category column. Click on the new Device Category column header to sort by that column. We are currently creating a website for a printing company who needs an access-controlled area for clients to upload files. One of the best things about Wordpress is the nearly endless supply of plugins that add functionality. And one of the worst things about Wordpress is the nearly endless supply of plugins. Many are out of date and do not work with the latest releases of Wordpress. Many don't work at all or are not ready for prime time. We expend considerable energy evaluating plugins and running them through our own internal certification process before foisting them on unsuspecting clients. After all, our clients trust us to deliver websites that work. For providing client upload functionality, we like Smartypants Client Document Manager the best. It does require the use of an additional plugin, Theme My Login in order to make access control be seamless for the user, but the end result works very well and gets along nicely with the other plugins and themes we use. I found a great (and simple) online tool for resizing images. While both Typepad and WordPress can automatically resize images in the body of a page or post, often you need to resize an image manually for placement in the sidebar. This tool at http://www.photosize.com does exactly that and nothing more. I was meeting with a new client yesterday and suddenly realized that everyone around the table had an iPad except me. While my client is an industry leader, they are not a high-tech company by any means. The message to me is that it is becoming imperative to test the websites and blogs we build not only for compatibility with the popular browsers, we need to be testing for iPad compatibility as well. "My Blog Posts aren't Showing Up on Facebook and LinkedIn"
At least once a month someone calls me or send me an email with this problem. The purpose of this article is to help you troupbleshoot it. The fact that your posts aren't showing up in TWO places is significant. It means the problem is not at either Facebook or LinkedIn. What else is in common? Are both Facebook and LinkedIn being fed from Twitter? Are both being fed your RSS feed via Feedburner? If the answer to either of those is 'Yes' then you have an additional point of commonality to investigate. Note the date of your last blog post that appears on Facebook and Twitter. That's important because the problem is mostlikely associated with the very next post, the first one that didn't get published on Facebook and LinkedIn. Usually when I investigate the problem, I discover the culprit is the client has pasted directly from MS-Word. Most people have 'Replace straight quotation marks with smart quotation marks' turned on, for example. Smart Quotes are not legal characters in an RSS feed and will bring things to a halt. Carefully look for curly single and double quote characters. Replace then with the stright variety. Switch to HTML mode (There is an HTML tab at the upper right of the Body field). Strip out everything that is not the text of your post. Switch back to Rich Text mode and reformat. The new TypePad interface is a great improvement, but when I saw it for the first time I knew I had to write Guide to the New TypePad. If you are a business owner who has been using TypePad for a while, the new interface will come as a shock. I can just hear you saying, "I have to learn it all over again". If you are new to TypePad - particularly of you have just come from another blogging platform - you are probably playing 'scavenger hunt' while you find everything. Step-by-step instructions for just about everything you want to do are in Guide to the New TypePad. I know because I've spent the last four years helping business owners get started blogging on TypePad and answering their "How do I..." questions. This is not a PDF! This is a 48-page plasticoil bound book. You know how frustrating it is to know exactly what you want to do but can't figure out how to make the software do it. Guide to the New Typepad will save you many times its price in terms of your valuable time. Blogging is Supposed to be Fun and Easy! GUide to the New Typepad will save you hours of learning and tons of frustration. Easy-to-follow step-by-step instructions will have you navigating TypePad like a seasoned master in just a few minutes. For everyone agonizing over the content of their META Keywords tag: lighten up. Other search engines still use them, however. Not long ago, my friend Any Wibbels hosted a webinar describing how to use a TypePad blog as an eCommerce website. You can view Andy's webinar here. An additional feature that I get asked about frequently is a landing page. This second method allows your landing page to share your blog's look and feel while eliminating distracting elements such as the Navigation Bar and Sidebar(s). You need to have a Pro account to use this method. Click on Blogs in the green band at the top of the page and select Add a Blog. For the purpose of this post we'll name the new blog 'Landing'. On the Design Tab select Choose a Theme and select the same theme for your new blog that you use on your existing blog. While still on the Design Tab click on Select a Layout and select the 1 Column layout. Next go to your main blog's Design Tab, click on Add Custom CSS and copy the contents of the large custom CSS field. Now go to your new landing page blog's Design tab, click on Add Custom CSS, and paste into the field. This will make sure that your landing page has the same look and feel as your main blog. Create a static page for your landing page content. (Click the down-arrow in the Compose button and select Page.) Very Important: Leave the Title blank. After publishing the page, click on the Settings tab. and select Posts & Pages. Scroll down to the Front Page section. Click on Display a 'page' as the front page. Since your landing page has no title the entry in the drop-down box will be blank. With two small modifications, the Journal theme makes an excellent blank canvas for a landing page. Click on Blogs in the green band at the top of the page and select Add a Blog. For the purpose of this post we'll name the new blog 'Landing'. On the Design Tab select Choose a Theme and select one of the Journal themes. While still on the Design Tab click on Select a Layout and select the 1 Column layout. No matter which of the above three methods you choose, to finish this project in a professional way you should give your landing page it's own short memorable domain name. GoDaddy is an excellent place to register a domain name because they give you complete control over all DNS settings. The instructions are in TypePad's Knowledge Base here. Typepad has an entire website dedicated to providing help and resources to small business owners who want to make the most of their TypePad blogs. You'll find a series of webinars, tools, and experts dedicated to helping you leverage your blog and other forms of social media to grow your business. To visit TypePad's Small Business Center, click here. Granted, if you have already upgraded your WordPress installation to 2.8.4 you are protected. Chances you you haven't. I'm not scolding you, I'm commiserating. You have a business to run. Receivables, Payables, Payroll. Not to mention working your tail off to produce your company's product or service. You have important things to do. Keeping your blog's software up-to-date to insure that the latest security holes have been plugged should not have to be one of them. the WordPress community has tried its darndest to make as easy as possible with one-click upgrades. If you use Plugins and Themes other than the ones that come with the default WordPress installation, it is advisable to start over with the more detailed upgrade instructions. So when people ask me why I I am so passionate about TypePad as the best platform for your business blog, This is why. Or at least one of the big reasons why. If you have a Typepad blog then all this stuff is taken care of for you. No worries. Just blog. Akismet. Great anti-spam plugin. It comes standard as part of the Wordpress files but neds to be set up, including the creation of an account on Wordpress.org. WP-Tags-To-Technorati Most people do not understand the Google juice that technorati tags give you. Feedburner Feedsmith The plugin will detect all ways to access your feed (e.g. http://www.yoursite.com/feed/ or http://www.yoursite.com/wp-rss2.php, etc. ), and redirect them to your FeedBurner feed. WP-Security-Scan Use this plugin to make sure that you are complying with best practices for WordPress. All-In-One-SEO-Pack Provides complete control of meta tags and title tags to give your blog its best shot at high Google rankings. WordBook Each time you publish a new blog post it will automatically appear on your Facebook wall. ShareThis Probably the best general-purpose chicklet for allowing readers to share your content. Twitter Tools Each time you publish a new blog post it will automatically also tweet it. TweetMeme Provide you readers with a visible way to tweet about your content. Also display the number of times the article has been retweeted. WP-DB-Backup Automatically backs up your Wordpress database at scheduled intervals. Does Your Wordpress Theme Support Printing? Today a new client came to me wanting some minor tune-up work done on her blog. It's Wordpress, installed on her server. Unfortunately - like a lot of Wordpress themes - no accomodation was made for printing. That "media=print" is the key. It means that the theme's author has thought about printing and if someone prints the page it has a higher probability of looking good when printed. Typepad includes the print version of the stylesheet automatically. It probably won't print your fancy banner but it will print the name of your blog and look presentable. A few weeks ago a good friend called me and said that something was wrong with his site. I took a look at hi site, a Wordpress-based website and saw nothing but a php error message. The long-and-short of it was that he had been hacked. Every now and then, a vulnerability is discovered in Wordpress. The release a new version to patch the hole, but it is up to you to keep up with the new releases in order to avoid the same fate as my friend. This is another reason why I like TypePad: It's always up to date and I never have to worry about keeping the software up-to-date. Typepad takes care of that. Since I'm on the subject of security, the biggest vulnerability of a Wordpress blog is typically the username: When you install Wordpress, it automatically creates an administrator account with the username 'admin'. If you don't change it, you've just cut the hacker's problem in half. The first thing you should do upon installing Wordpress is to create a new administrator account with a unique name and delete the 'admin' account. If you host your own blog (using Wordpress, for example) don't forget about the security of your FTP account. FTP is the method for uploading and downloading files to and from your server. (If you installed Wordpress on your server, FTP is the tool you used to get the files onto your server in the first place.) If your FTP account password is compromised it may take days to figure it out. Make sure you have a good strong password there too. Almost everyone needs to create a Landing Page now and then. If you are using Wordpress, most themes contain a 'No Sidebar' template and you can use that. For this client we created a special template that removed the theme's extraneous background colors. Typepad users may be frustrated because they can't select the template on a page-by-page basis and don't have a way to eliminate the sidebar. Here's the trick but it requires a PRO level Typepad account: Create another blog in the same account. Select the same theme and give it all the same stylesheet customizations. Then select a Layout that contains no sidebars. The final thing you should do is to give the landing page it's own short memorable domain name. 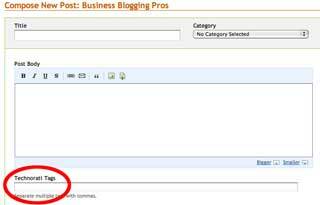 GoDaddy makes it very easy to forward a domain name to a specific page on your blog. OK, first some background: I build blogs for small business owners. What happens when your blog is also your website? (a good example is here) You need some extra pages: Perhaps one to describe your services, one for your public speaking schedule, another for your press releases, etc. Maybe even one for your online store. The logical way to provide visibility and access to these pages is via a horizontal nav bar, typically positioned just below your banner or header. Many (but not all) Wordpress.com themes support a nav bar. If it's not a page, I can't put it on the nav bar. I may want to have a link to something on another site (such as my website, an online ordering page, another blog for my podcasts) up there on my nav bar. Can't do it with a Wordpress.com blog. I'm stuck with my page titles as navigation items. My page may be titled "Explore our exceptional, personalized services" but I probably want something shorter like "Services" on the nav bar so it doesn't take up so much space. Again, I can't do it with a Wordpress.com blog. Typepad, on the other hand, lets you do what you want. Want a nav bar item pointing to something offsite? No Problem. Want to use something other than the page's actual title? No Problem. Want to use a special post category as a navigation item? No Problem. Want to point to another blog containing your podcasts or videos? No Problem. Understand that I use both Typepad and Wordpress. When I have a new client, I spend time with them understanding what they want to do now, as well as what they may want to do in 2-3 years. Then I pick the best platform for the circumstances. Typepad's implementation of the navigation bar is one of the reasons the client usually ends up on Typepad. Typepad is quietly rolling out a great new feature: When you publish a new post on your blog, it can automatically notify the world via Twitter, FriendFeed, LinkedIn, Facebook, etc. I'm starting to see this option in some of the blogs I maintain. You simply select the service you want to connect to Typepad, enter your login information for that service, and Typepad does the rest. I seldom see Typepad blogs with nice professional-looking footers. Most websites have them and adding on to your Blog helps make it look a lot more professional as well. We recently created a blog with a footer for a client and it occurred to me that I should share the technique. It's actually almost trivial to add a nice footer to your Typepad blog without resorting to Advanced Templates (I almost never use advanced templates because you give up so much flexibility and control.) To use this method the footer must be constructed entirely as a graphic image. One prerequisite: Your Typepad blog must be at the 'Pro' level or greater. Most of Typepad's recent templates are 940pixels wide, so create your footer graphic the same width. Make note of it's height in pixels and then upload it (Control Panel ->Files). Record the resulting URL of the file. Replace "URL-of-your-footer-image" with the url you recorded above when you uploaded your footer image. Replace the "131" with the height of your footer image in pixels. In a recent blog post Guy Kawasaki talked about the value of making it easy for people to tweet on your behalf by including some kind of ‘Tweet This’ link or icon with every piece of content. The Twitter equivalent of Digg This, so to speak. This article describes an easy way to add such a link to each blog post on your Typepad blog using Feedburner’s FeedFlare service and a Personal ‘Twit This’ flare provided by Eric Olson. Go to http:/www.Feedburner.com and click on Register. Fill in the registration form. Remember the username and password you supply. After registration, you don’t have to do anything else right now. Go ahead and sign out. Sign into your Typepad account. Click on the Configure tab. Click on Feeds. Halfway down the page, locate the Connect to Feedburner button and click it. supply the Feedburner username and password you created in Step 1. After connecting your blog to Feedburner, click on the Design tab. Click on Content. Look for a checkbox labeled FeedFlare. Turn it on and click Save Changes. Time to log out of Typepad. Continue with step 6, below. If your blog is already connected to Feedburner, start here. Log into your Feedburner account. Click on the Optimize tab. About halfway down the left sidebar is FeedFlare. Click on it. Scroll down until you see this Add New Flare field. Click on the Browse the Catalog link. Scroll down until you see the Twit This! entry. Right-Click on the word Link and copy the link/shortcut. Close the popup window, paste into this field and click the Add New Flare button. “Twit This” and a pair of checkboxes should appear just above the Add New Flare field. Turn ON both checkboxes. Click the Save or Activate at the bottom of the screen. The next time you create a new blog post, Feedburner will add the Twit This link to the end of every post in your blog. One of the little-noticed features of the new Typepad platform is that your blog can now have a horizontal menubar just below the banner. Look for 'Navigation Bar' and turn it on. Click on the Edit icon the little pencil) associated with the Navigation Bar feature. Up until now, the only way to have a menubar was to have a geek set it up for you. Usually, this meant using 'Advanced Templates' which means giving up a lot of flexibility and control over changing the layout and content f your sidebars. This is great news, particularly for people who want to use their blog as a website as well. Maybe that title is an exaggeration but I've spent some time using Typepad Connect (I've turned it on for this blog) and though it has some rough spots I think it is going to be a big plus for those of us who want to build a sense of community around what we do. The best part is the fact that you can now have threaded comments. In plain english, this means that when a reader leaves a comment, it is easy for a second reader (or you) to reply to the first reader's comment. You can see in the snapshot to the right that my comment is indented under Larissa's, indicating that my comment is a reply to hers. In the past with unthreaded comments these sort of conversations were very difficult to follow and participate it. Typepad Connect makes it very intuitive and natural. The second interesting thing about Typepad Connect is that you can click on the little picture next to my comment and see my profile. You can learn a little about me, the conversations I am participating in around the blogosphere, and get a feel for my credibility, authority, and trustworthiness. Typepad Connect has it's rough spots: the 'Post' and 'Preview' buttons are sometimes missing, and currently Typepad Connect's login screen is case-sensitive (Typepad's main blog login screen has always been case-insensitive) and this will cause great consternation until it gets sorted out. The big deal here though is at a slightly more abstract level. Typically (unless it's a community blog) the conversation on a blog is one-to-many, meaning that the blog owner is having conversation between himself and his readers. There really have not been a good way to have conversations that are many-to-many (In other words, for readers to converse with each other). A tool that supports those many-to-many conversations is necessary in order to effectively foster a sense of community. (I realize that at a much higher level, we do have that with multiple blogs and the foodie blogosphere is a great example.) Up to this point we've resorted to using other tools such as Facebook groups, Ning, discussion groups, forums, etc to fill the gap. Though it's not all the way there, Typepad Connect now makes it possible to build these ckinds of communities using our Typepad blogs. This topic has come up three times in the past two weeks. Almost everyone is comfortable using MS-Word. Spell-check and all the editing and formatting features make it seem like a great way to compose and format a blog post, right? It is easy to be fooled. You can copy and paste directly from MS-Word into the 'New Post' or 'edit Post' form and it looks like it will work just fine. The problem is that the code that MS-Word creates is not web-compatible. The biggest offender is Word's ability to change straight quotes into curly quotes. (Look for "Replace straight quotes with Smart Quotes" on the AutoCorrect dialog box.) Those curly quotes are not web-compatible characters and will play havoc with your RSS feed, among other things. It is possible though to use MS-Word as a blog composition tool. Use this option when you are mainly interested in using Word for spell-checking and getting your thoughts out of your brain and onto the screen. Then click on Display Options again and select 'Rich Text + HTML' instead of 'Markdown'. You can then use Typepad's controls to format your post. The Word Blogging Tool - included in the new Microsoft Word as part of Microsoft Office 2007 - lets you publish to your blog from inside the familiar Word environment with a single click. TypePad is a default option in Microsoft Word, which makes it simple and straightforward; all you'll need is your Typepad username and password. Better yet, the HTML the tool writes to your blog is in a simple, blog-friendly format. Yahoo! Pipes may solve a problem I have been complaining about a lot lately. When I do Reputation Monitoring or erecting a Driftnet, I basically create several RSS feeds of searches. Let's say that I want to monitor references to my name, Dave Barnhart. I'll set up a Google Blog Search and a Google News Search on "Dave Barnhart". But because Google doesn't catch everything, I'll also use Technorati, Feedster, Bloglines, BlogDigger, and other blog search tools. While that better insures that I don't miss anything, it also means that I have to wade through a lot of duplicates. I've often said, "Wouldn't it be nice if I could run all these RSS Feeds through some sort of filter that would remove the dupes?". Enter Yahoo! Pipes. I haven't given it a rigorous test but I've played with it a little and the interface is so intuitive that I didn't even have to read the documentation to figure out how to build a pipe to do just what I was looking for. You simply drag tools or modules from the left sidebar, configure them, and then drag a connector between them. Cool and easy. I'll experiment with it more over the next few days and let you know how it is working out. 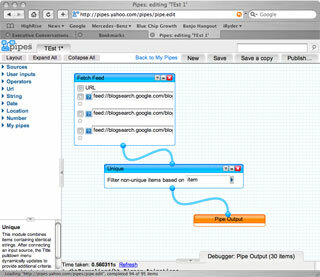 I bet that Pipes will become a regular part of my toolset. Brian at Pajama Market talked today about adding Google Search to your blog. We're not talking about searching the internet. We're talking about searching your previous blog posts. If youare striving to develop professional trust, be seen as and authority, and have your blog be viewed as a reference, then the ability to search your previous posts is important. While Brian describes how to accomplish this with Google but I have been setting all my client's blog up using the new Technorati Widget. You can see it in action in my left sidebar under Technorati Tools. Simply type in the search term and click Search. 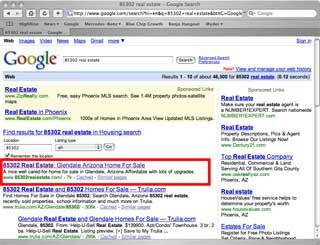 You will be taken to a Technorati page that displays all the posts on my blog in which contain the search term. I also typically enable the "Blogs that link here" feature of the Technorati Widget. If readers come to your blog looking for information, helping them find it - even if it is on a colleague's blog - is doing them a service. UPDATE: Currently we are using Lijit for this function.